When preparing a resume and cover letter to score the job of your dreams, what you have to say is important, but so is how you say it. No matter how perfect your pedigree or impressive your experience, making mistakes on your resume can undermine your job search efforts. It’s essential to avoid the biggest resume writing mistakes. Review the top three resume writing mistakes to avoid, courtesy of Grammarly, an automated proofreading company. Which of these two example texts appeals to you more? I have an MBA from Duke University. My sales team has performed really well. I have worked for two Fortune 500 companies since graduation. After graduating from Duke University, I put my MBA to work at Ingles Markets, a Fortune 500 company. I lead my sales team at Lowes, Inc. to increase revenue by nine percent last year in the third quarter. The differences between Example A and Example B are increased specificity and varied sentence structure. They offer the same general information about our hypothetical candidate’s qualifications, but the second example goes into detail about work experience and achievements. Being able to put an exact number on the increased revenue is much more impressive than a vague statement. Although you might not have been able to put your finger on it, the other reason the first example seems lackluster is that every sentence uses the same basic structure. Use a variety of sentence structures and lengths to give your resume more appeal. Why? Because a simple sentence, which consists of a subject and then a predicate, can be very effective and direct, but using only one type of sentence can make your reader lose interest. Aim to incorporate a variety of sentences—simple, compound, complex, and complex-compound—into your writing to keep it feeling fresh and lively. No one wants to be thought of as passive, and yet passive voice often shows up in business writing. Passive voice performs a switcheroo on the subject and predicate of a sentence, as in, “The customer service campaign was overseen by the regional vice president of sales.” In that example, the person doing the action (the VP of sales) comes at the end of the sentence. It would be much clearer to rewrite the sentence as: “The regional vice present of sales oversaw the customer service campaign.” Use this active voice whenever possible. Use of the passive voice is not a grammatical error. 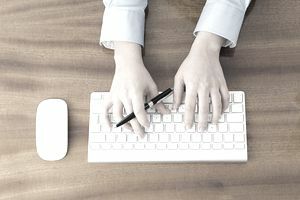 It’s a stylistic issue that pertains to clarity—that is, there are times when using the passive voice can prevent a reader from understanding what you mean. Write with as much clarity as possible. The last thing you want to do in a resume or cover letter is to make your potential employer work harder than necessary to understand what you mean. Passive voice also communicates a certain, well, passivity that won’t help you get your foot in the door. Take charge, own your actions and experience, and always write in the active voice. Grammarly has covered the importance of action verbs in resumes before, but it bears repeating here. Boring verbs send the wrong message to recruiters and using them won’t help you make a great first impression. Job seekers want to be seen as active, motivated employees, so why are so many resumes filled with the same old lifeless verbs? As Career Expert Jessica Holbrook Hernandez says, “Instead of using phrases like ‘served as,’ ‘duties included,’ ‘promoted to,’ ‘worked with’…choose strong action verbs. Action verbs do just what they say: they convey action and, ultimately, results.” For each of your job duties, brainstorm a list of specific, exciting words to describe what you accomplished. If you get stuck, check out this thesaurus for new ideas. Remember, the way you present your resume and cover letter demonstrates not only your ability to communicate clearly and effectively but also shows the level of care and attention to detail that you take with any task. Employers are always looking for careful, detail-oriented people so make a sharp first impression by avoiding the common writing mistakes. Avoiding the mistakes presented here will go a long way to getting your cover letter and resume noticed, but there are a few additional mistakes you’ll want to avoid. For example, you don’t want to have spelling errors. But misspelled words can be easily missed so use a service such as Grammarly or ask a friend or colleague to proofread your cover letter and resume. Keep in mind there are some things that shouldn’t be included in your resume. Don’t list your personal information, such as religious or political affiliation. There’s no need to list your hobbies either. Stick to information that’s relevant to your career journey and job hunting. Be sure to include information on your skill set. It’s important to describe the skills you have and how they’re the perfect match for the job you want. Think about your thought processes, administrative skills, communication and people skills, and more. Feel stuck? Take a look at these skills lists for resumes for inspiration.